I’m pretty sure most would agree that we live in the age of great misinformation. One must be highly committed to finding hard facts where it truly matters, and just as committed to rejecting suspect information from questionable sources. Unfortunately, qualifying the source is often just as difficult as otherwise distinguishing truth from mistruth or even half-truth. Amongst my favorite quotes of wisdom is from Mark Twain, saying that “The problem is not so much what we don’t know; it’s what we think we know that just ain’t so.” It doesn’t help that, while it has never been easier to quickly find information than it is now, with just a few clicks of a mouse, we too often believe that what pops up in the top five results on our browser is somehow supposed to be relied upon as truth. Any intelligent person has figured out already that there are legions of characters out there on the World Wide Web phishing for dupes and suckers to buy their snake oil, join their cult, or simply validate their outright craziness! And now we find that Russia and other foreign actors have hijacked Facebook and other social media to misdirect us and pit us against each other! These are big revelations for certain, but not really shocking, are they? God help us! While it sounds like I’m about to launch into an editorial on today’s political theater, and I could, that’s not where I’m going. You’re welcome. This really is about real estate. It’s about looking for the right information for your purposes and looking for it in the right places. I want to tell you a quick story about an epiphany I had when I was probably 10 years in the business, and very active in Industry leadership. When I was president-elect, and subsequently president of my local Board of REALTORS, then director and eventually vice-president of the State Association of REALTORS, I traveled regularly to state and national conventions to learn, collaborate, and ply my influence on ethics, policies, and benefits of our vast membership. My favorite presentation to attend at the national meetings was the Economic Issues and Trends Forum presented by the National Association of REALTORS economist John Trucillo. John knew his numbers well and presented in a very engaging, if not entertaining, fashion. When the time came that I relinquished those positions that allowed me to attend the national conferences, I missed his presentations so much that I would order the session recording. One such recording from his presentation in Chicago had a local broker speak ahead of him, and what he said forever changed my approach to gathering and disseminating information for my market knowledge and especially for the benefit of my clients. This “warm-up” speaker correctly stated that many of us were trained by charismatic, big-name sales trainers that, when the question is asked “How’s the market?” there is but one answer– “Fantastic!” And this speaker said, as I had already decided, that that answer is absolute BS! In fact, “How’s the market?” is a real question, and it deserves a real answer. He explained that, if you and I were to stand on opposite sides of my front door, and the question was posed to each of us, “What color is this door?” we would likely have entirely different answers, though we are both telling the truth about the very same door! The moral of the story– Our perspective entirely changes the reality of the situation. 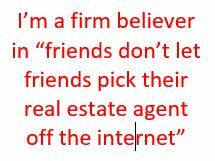 This is true for more than just real estate, by the way. Well, from the moment of that realization on I took extra pains to be sure that the information I obtained for my clients was relevant from their individual perspective. Hence, I learned that when the question is asked, “How’s the market?” there is only one true answer. “It depends.” It depends on if you are a buyer or a seller. It depends if you are buying or selling in northeast Denver, or the southwest suburbs, or northern or southern foothills. It depends what price range is in question and if this real estate is single-family, multifamily, residential income, land, or commercial. It depends on how this real estate is to serve you, i.e. long or short-term residence, or long or short-term investment. Can you now see the importance of knowing what questions to seek answers to? Let’s circle back now, to the subject of your source of information. Again, the internet is flush, and truly there is a lot of reliable, accurate information available there, but only if you are diligent and discriminating about what information to trust. Honestly, it’s not unlike looking for information on how to deal with health issues. If the issue is not serious, and there’s not a lot at stake, experiment all you want. But if the issue is serious and you know you need the optimal solution, then consult an experienced professional that can help you ask the questions that you didn’t even know you should be asking, and get accurate, useful answers. Wishing you happy homes and a fantastic 2019!